If you're looking for a particular manufacturer that you can't find here, check on the where are they now? page or try using the search facility. Back from the dead! Bigfoot has been featured on our 'Where are they now?' page having been forced into "permanent closure" in November 2008. But it was not so permanent after all it seems - since January 2010 Bigfoot has been under new ownership and production has resumed, including their successful truck camper range. The website's dated 2005 so this may no longer be a going concern but International VentureCraft Corp. of Vancouver offer what, as far as I know, is the world's only two-bedroom demountable. (I suspect it's also the world's only vertical slide-out!) They also make/made three other models. You probably shouldn't consider i4's 'Toy Box' if what you're looking for is simply a camper, but if you're looking for a dual-purpose toy hauler/camper that is also demountable then it's one of few companies, and maybe the only one, filling that niche. Northern Lite manufacture five series of truck campers, each consisting of a number of different models, all of which come with several options, so the available permutations are numerous! What they all have in common, regardless of their size or spec, is their two-part glass-fibre bodies. West Coast Leisure Homes Ltd. produce the extensive Okanagan range including hard-side truck campers in twelve different layouts with up to three slide-outs. The Action Camper is an innovative pop-top expedition demountable from designer Eric Thaler. Unfortunately, unless you happen to own one, it's only available for Jeep base vehicles. The website offers comprehensive details, including the option to download all the CADs which is a nice touch, but there's no mention anywhere of a price. Maybe it's a case of 'if you've got to ask, you can't afford it'. Washington-based manufacturer of Alaskan rising-roof campers since 1953. Not the easiest website to navigate but there's some good material on it and it's a classic design. All Terrain Campers manufacture five models of aluminium-framed demountable aimed primarily at the off-road market. Named after various big cats, they all have rising roofs in either pop-top or clamshell format. 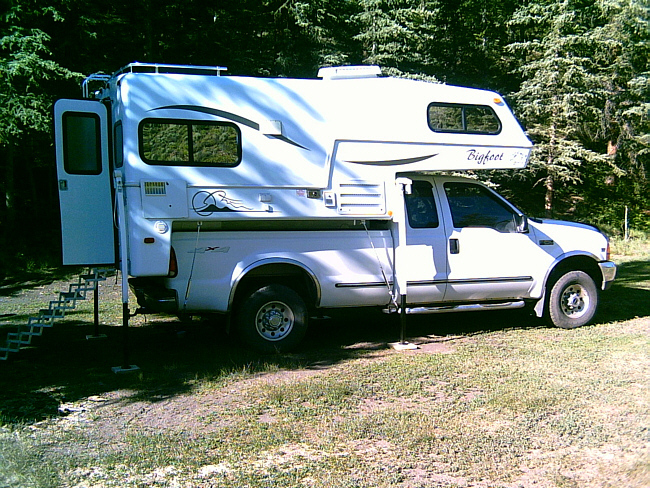 Adventurer Manufacturing, based in Washington, produce two complete ranges of hard-side truck campers under the 'Adventurer' and 'Eagle Cap' brand names. Camp Craft offer a range of eight models of camper, all boasting 'Polar Plus' insulation for which they claim an implausibly high R-value of 21! Although there is no indication of it on their website, they are apparently based in Indiana. Talk about a niche market! Capri from Texas target 'rodeo cowboys' with their campers. You won't be seeing many of these on the streets of Luton then! There are seven models in total, ranging from basic to luxurious, all with Capri's signature 'quilted' aluminium finish. Colorado-based Casual Turtle Campers hand build, to order only, two styles of demountable - the original Casual Turtle Camper and the more recent Half Shell (without overcab). They are both beautifully made and finished in Western Red Cedar and they share Casual Turtle's unique and very elegant domed roof. Chalet RV produce a range of only three demountable campers - all hard-side and all called the 'Chalet'. Although they are all the same size they each offer a different layout. With their various slide-out configurations and highly-spec'd interiors, they are all undoubtedly aimed at the luxury end of the market. Duracozy produces just one model of "expandable camper" that folds away into a very compact and robust glass-fibre shell. It's a neat bit of kit, aimed squarely at the hunting/fishing/outdoor market. If you search the website you'll find details of its weight and size but no indication of its price and, if you try to run the embedded YouTube clip, it tells you "This video is private"! Fortunately you can watch it here instead. North America, being the home of the truck camper, inevitably boasts a huge number of manufacturers of all sizes. The list on this page is almost certainly not comprehensive but I think includes most of the major manufacturers. I try to check these links on a fairly regular basis but if you find dud links or if you are aware of major omissions, please let me know.